Utilizing mars rover-like drone robots to precision rake the soft, dusty surface of the moon and using the natural shadows created from the resulting trenches, Moon Publicity intends to auction 44 spots to accredited investors and companies for placement on the moon some time in the near future. 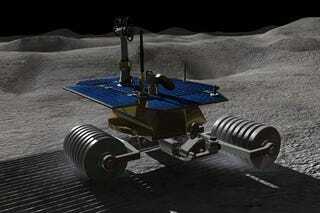 A few question arise— How will they get the robots to the moon's surface? What are the legal ramifications, if any? Will a governing body step in to prevent us from having to look at Vince the "ShamWow" guy every night? We know they're somewhat legit because they've provided a semi-legible press release and a 3D animated demonstration. Oh, and they have a blog. WEST VALLEY CITY, Utah, July 20 /PRNewswire/ — It's one giant leap for robot-kind. New Shadow Shaping technology creates images on the Moon that can be seen from Earth. Robots are used to create several small ridges in the lunar dust over large areas that capture shadows and shape them to form logos, domains names, memorials or even portraits. Talk about the Man in the Moon! You can even carve your initials in a heart to impress your sweetheart. The advertising potential is mind-boggling. Never in history have companies been able to penetrate every market on Earth, reach every person on the planet, and touch them at an emotional level only possible with the beauty of the Moon on a starlit night. Twelve billion eyeballs looking at your logo in the sky for several days every month. And since there is no atmosphere on the Moon, the images last for thousands of years. "Finally dependency on government to travel beyond Earth is over," says inventor David Kent Jones. "This new commercial incentive will turbo charge space technology development. Shadows are just the beginning; eventually robots will be planting crops on other planets." Beginning July 20, 2009, the fortieth anniversary of man's first step on the Moon, exclusive licensing for this patent pending technology is publicly available. Moon Publicity is accepting bids from accredited investors and companies for 44 lunar regions until October 20, 2009. You could license moon-imaging technology potentially worth a fortune in advertising value for about the cost of an SUV. Minimum bids start as low as $46,000. For more information visit MoonPublicity.com.